20/20: 20 days. 20 ways. 20% less carbon. We know you're already pretty cool and smart. But we can help you get even cooler and smarter. 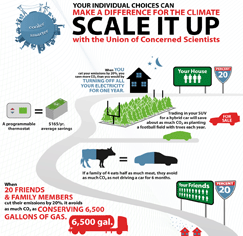 Your path to reducing your global warming emissions by 20 percent in just 20 days starts here. It's easy and fun, we promise. 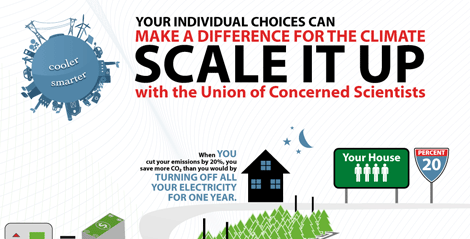 Think small changes can't make a big impact? Take a look at what a cooler smarter town looks like. Or a cooler smarter country. We've got a few simple questions in just three categories. Choose the answer that best matches your circumstances and habits. Be honest, now. Enough cargo space that friends often ask me to help when they move. Logged a ton of miles but keeps on chugging. All the standards: A/C, stereo and enough room in the trunk for a weekend getaway. A fancy electronic readout about my fuel consumption. A conductor so I can read or game as I'm on the go. Accumulate quickly from business trips, allowing me to take lots of nice vacations. Accumulate slowly through the occasional family vacation, but not fast enough. Don't exist because I don't fly nearly enough to use them. Listening to tunes or an audiobook on my long solo drive to and from work. Running errands or shuttling the kids around. Talking to the neighbor I commute with. I'm rarely in a car because I take public transportation, bike, or walk on most of my trips. Working in my garden and tending to my lawn. Lying on a beach or teeing it up on the golf course. Playing in the snow or reading a book by the fireplace. Playing video games or watching the latest blockbuster. Enjoying a book on my e-reader. The latest thing. I like all the newest gadgets and try to keep up to date. Vintage and retro items. I like the classics and find beauty in older things. Anything labeled organic, natural, or green — I'm always looking for things that are good for me AND the planet. The basics, I might splurge on occasion, but for the most part I have simple needs. I'm greeted by the hiss of escaping air as I pop the tab on a soda or open some sparkling water. I try to get some extra vitamins in with bottled juice. A bottle of spring water is never far away. I turn on the tap. Load up on soda and beer to keep my spare fridge stocked. Buy only local and organic produce whenever possible. Buy fresh berries, tropical fruit, and cut flowers for the table. Maximize convenience with ready-made meals that are quick and easy. Fire up the grill for some tasty cheeseburgers. Cook up a veggie stir fry. Pop a frozen dinner in the oven. An Old Master—a classic, even if it could use some restoration. A new work by an up-and-coming artist or a modern take on a timeless classic. An unfinished work in progress—it will be great after a lot of changes and improvements I want to make. A work on loan. I'm enjoying it now but it will have to go back to its owners when the lease ends. I crank the dial on the thermostat to keep warm. My thermostat automatically kicks in for all the hours I'm home and awake. I'm stuck dealing with whatever temperature my landlord has set for the building. It rarely gets cold where I live. I'm more likely to need the A/C. Flip the switch and don't think much about it. Turn off lights whenever I leave the room and often even unplug the microwave to save energy. Swapped out my incandescent bulbs long ago. Know where my electricity comes from and even keep track of my state's renewable energy standards. I hate to buy new ones when the old ones work fine. My furnace was installed back when "Disco Inferno" was heating up the charts. I have a second refrigerator/freezer so I'm always well stocked. My house is a constellation of "Energy Stars." Step 2: Choose your path to 20 percent. Step 3: Get your FREE sticker. 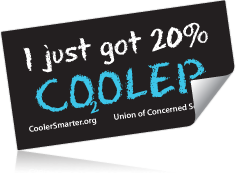 Fill out the form below and we'll send you a sticker to help you start spreading the word (and letting everyone know you just got 20 percent cooler). * Please note that stickers will arrive in 6-7 weeks. We only ship to the United States. Don't want the sticker? Click here » Place my free sticker order « Go back to the tips. Step 4: Thanks, your sticker is on its way! 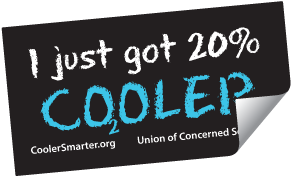 You're already cooler and smarter for taking the 20/20/20 challenge and doing your part to reduce your carbon footprint. Want to make your friends and family cooler and smarter? Share the 20/20/20 challenge with 20 people — friends, family, neighbors, classmates, and coworkers — to help them find the best ways they can reduce their footprint and save money too. Does eating local help fight global warming? You might be surprised. Become a UCS member and get your complimentary copy of Cooler Smarter: Practical Steps for Low-Carbon Living to find out. « Join Today! Already a UCS member? Order the book here.